8 November Tuesday, In New York time the voting (US Election) is expected to open between 6 am to 7 am and close at around 7 pm to 8 pm in most of the areas. It may continue till 9 pm in Iowa and North Dakota. The real clarity will emerge around midnight India time on Tuesday night and by Wednesday 8:30am India time, all the voting will be over. Usually we’ll know the winner by 2am IST on Wednesday And if it is a really hard fight then latest by 6am Mumbai time. As the US Elections and Election results are near and its time to lookup into the NSE sector performance. Below Chart shows the sector performance year to date. Nifty Metals and Nifty Auto are the top performer for this year and gained 46.14% and 18.52% respectively and relatively outperformed the benchmark index Nifty 50(5.91% return). 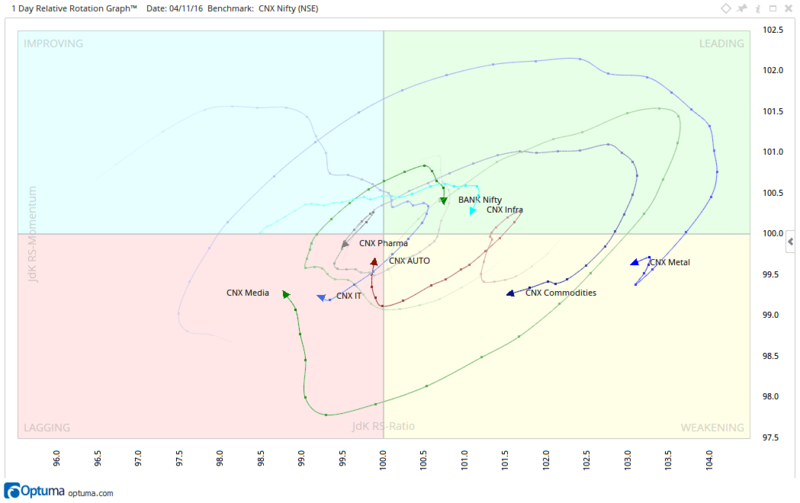 Relative Rotational Graph indicates that sectoral weakness visible in Pharma, IT, Commodities and Metal sector where the momentum is falling and also falls in the weakening and lagging quadrant. which underforming nifty currently and also likely to underperform in the near term. CNX Infra and Bank Nifty is showing a falling momentum but still circling around the leading quadrant.